Any nonprofit type and size. 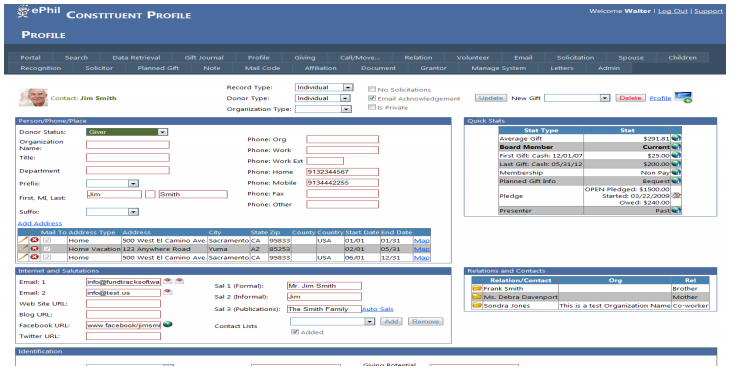 ePhilanthrAppeal, a donor management software that's second to none! Pros: Easy to use. Affordable. Service is friendly, fast, and helpful. Reporting is rich. Software is easy to learn. I love the pie charts and graphs. The user portal can be customized to show your top 10 donors or the donors you steward the most. Training is good. I believe this fundraising software doesn't get enough credit. Cons: Lots of features - too many to use. Overall: Whenever I talk to fundraisers looking for software, I always recommend Fundtrack Software and their ePhilanthrAppeal product. When I first found Fundtrack Software, I used their non-internet version called PhilanthrAppeal. I used it for nearly 14 years at the same organization. When I moved to my current position, I immediately purchased their internet version, ePhilanthrAppeal. It migrated easily and my entire team find it easy to use. I highly recommend the ePhilanthrAppeal because it is effective, it keeps us efficient, it's easy to understand, and it's a tool that helps us move our donors up the donor pyramid. I highly recommend this software to any nonprofit. Pros: PhilanthrAppeal is easy to use. The on-line trainings are extremely valuable and in my opinion necessary to get maximum usage of the software. In my career I've used Raiser's Edge and other software, and find PhilanthrAppeal the best on the market. It's economically priced and the tech service is efficient and fast. The Call Tracking and Moves Management components are included in the initial purchase and both are outstanding. I couldn't imagine my fundraising department without it. Cons: The only con I can think of is that we don't utilize all the features that it offers. The software is complete; yet we're not able to utilize all that it offers. Overall: I highly recommend this software to any nonprofit that is currently looking for a software that will support the fundraising efforts of their shop. I would highly recommend this software to anyone. Pros: I highly recommend PhilanthrAppeal! I have found this database to be exactly what our agency needs and wants. It is very user friendly and not daunting at all. At the same time, it is very powerful and can pull very detailed and complicated reports with ease. The customer service is the BEST! If I ever have a problem or question, Fundtrack Software is on top of it! They call or email immediately and make sure I am well taken care of. I feel comfortable contacting them with any questions I have. Overall I think the service and the software are outstanding. Overall: I would highly recommend this software to anyone. Our sincere apologies for somehow missing this request for this brief review the first time around. We're thrilled with the way ePhil is staying ahead of the curve and the practical ways in which you appear to be updating the software. Your Customer Service is second to none. Learning ePhil is quite intuitive. I think we (at our end) just have to work harder at getting deeper inside it to take more advantage of the $145 monthly fee. I hope to be in touch with you for a 1-1 session as we ramp up our Fall 2014 season. We're glad to still be in business (re the Sac Phil/Opera Merger challenge effort gone south). Comments: I am not a very technically inclined individual and ePhil is just one of many of the tasks I am responsible for. If I spent more time working with ePhil and actually putting my ePhil training into practical use, I'm sure it would come easier to me and make more sense. I work for a non-profit so there is limited time and financing devoted to training. Charles King has provided excellent customer service. His manner of teaching is very clear and direct, I get a lot out of our sessions. I wish I could participate in more! Pros: PA is very intuitive and easy to use. I especially like the pre-done reports as well as the journal feature. It is also a fantastic value for the price. Customer support has been truly outstanding and supportive. Cons: When it is on a terminal server, there are problems with the email feature but I think that is more of an internal issue than an issue with the product itself. Overall: Would buy it again in a heartbeat. Comments: I have used ePhilanthrAppeal for one year. It is very flexible, and the training sessions and customer service are excellent. Keep in mind that when you use any database, how you enter the data is incredibly important. Also, if you are not good at designing reports or don't have the time to do it, invest in having them designed for you. PhilanthrAppeal is a comprehensive program that's easy to use, but BEST part is the great service. Pros: Easy to use, comprehensive, great customer support. Overall: PhilanthrAppeal is a comprehensive program that's easy to use, but BEST part is the great service. When I need help I get SAME day one-to-one support with the SAME person every time. Charles is very helpful and easy to get a hold of by email or phone when I need him. Thanks PhilanthrAppeal for making my job a lot easier! I recommend Philanthropeal to other fund development directors and staff and will continue to do so. Pros: Very responsive and capable tech support! Cons: Data could is easier to manipulate though I look forward to what I am sure is even better development in that area. Overall: I recommend Philanthropeal to other fund development directors and staff and will continue to do so. Comments: ePhil has been a great product for our non-profit and most importantly the customer service has been fantastic!